Do you have a Cava Grill where you live? If not, let me introduce you to their amazing grain bowl with this copycat Cava grain bowl recipe. 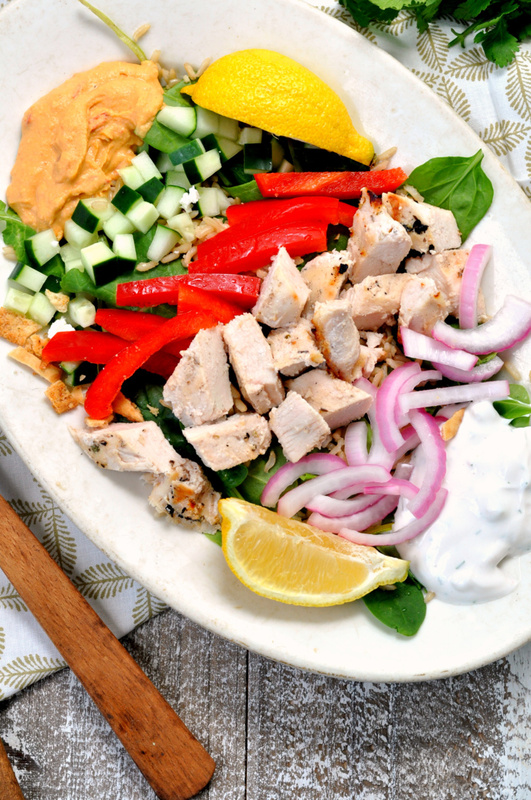 You build your own bowl with yummy ingredients (think Chipotle style) like hummus, grilled chicken, and fresh vegetables. It is the ultimate destination for a quick and delicious lunch or dinner. 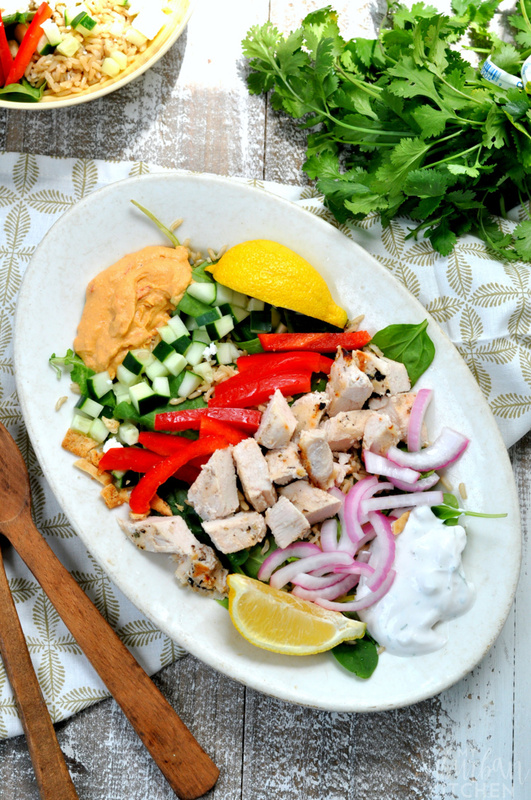 This copycat Cava grain bowl recipe features of a few of my favorite items but the possibilities are endless. You can stick to just rice (white or brown) or add in spinach like I’ve done. 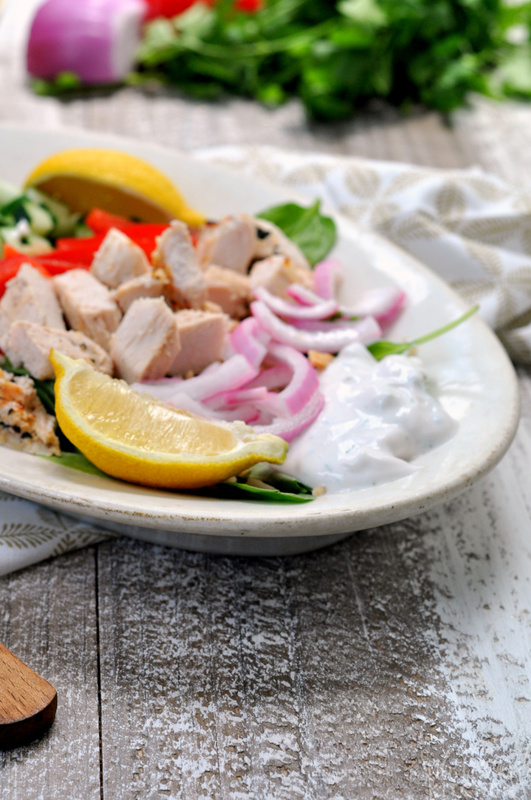 One thing I never leave out is a fresh lemon slice and some tzatziki sauce. One of my favorite toppings is the pickled red onions. For this recipe, you can quick pickle the slices in rice vinegar. Just combine the onion slices with vinegar and let sit in the fridge for at least 15 minutes. While I typically use grilled chicken in my copycat Cava grain bowl, falafel or even roasted vegetables would be delicious too. In fact, I typically half the protein in my order and substitute the other half with the roasted seasonal vegetables. If you make this Copycat Cava grain bowl or any other recipe from the blog, I’d love to know about. Let me know in the comment or snap a photo and tag it #MySuburbanKitchen on Instagram or Twitter. 1. In a medium bowl, combine yogurt and lemon juice. Stir to combine. Add chicken and marinate for 10 minutes. Remove chicken from marinade and cook (grill, stovetop or oven). 2. Divide rice between two bowls. 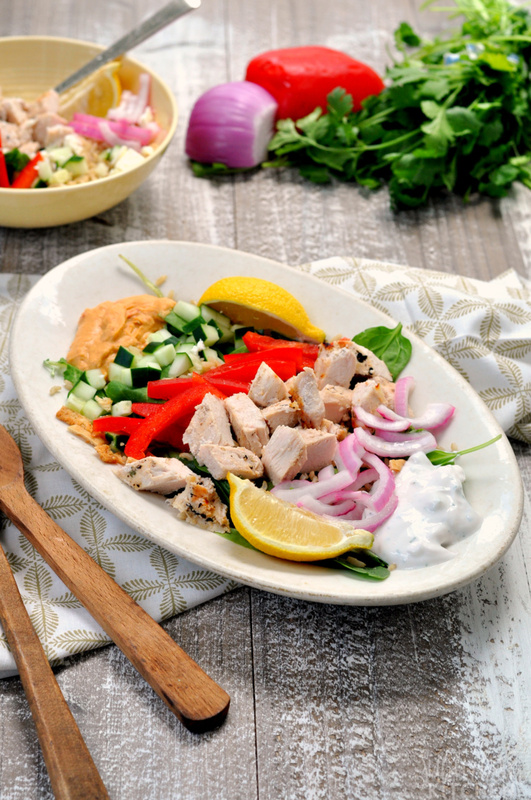 Top each with red pepper slices, red onion slices, hummus, tzatziki, cucumber, spinach and cooked chicken. Serve each with a lemon wedge. To quickly pickle red onions, place sliced red onion in bowl and add 1 cup of rice vinegar. Transfer to the fridge and let sit for at least 15 minutes. I think this is a nice idea for a healthy dinner. Sometimes me and my girfriend don’t know what to eat at evening since it should be light and this recipe is a good choice.